It's November. It's Evie's month. One year ago today I was anticipating my broken baby girl to make her debut in this world by the end of the month (here is the post I wrote last year). I had no idea we would meet her just seven days later. But really, it was perfect timing. I'm not putting too much pressure on myself to blog this month - I'm not sure how I'll feel? And sometimes blogging is good for my feelings and sometimes I just need to be quiet. Thank you in advance for being kind and understanding. There is absolutely no pressure to participate in any or all of these activities, but I know Evie's little life has touched people in big ways and I wanted to provide an opportunity for those people who wanted to, to show love and support. Thank you in advance to those of you who choose to celebrate birthday week with us. But, even those of you who don't, thank you for following here and giving my sweet girl a special place in your heart. It means so much. What a wonderful idea! 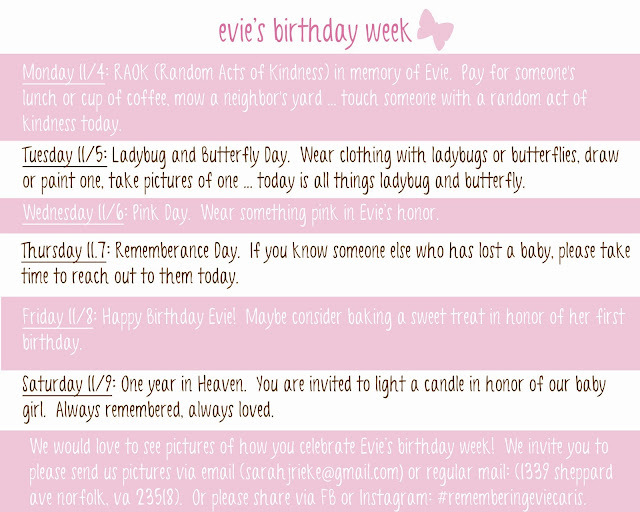 Been thinking of you lots as Evie's 1st birthday approaches and I love these ways to honor her this coming week. Much love to you! Oh wow!!! I am thinking of you, and so glad you are doing birthday week. I will definitely be taking part in Evie's memory <3 Sending so much love and prayers your way. I was already planning on wearing pink for Evie one day, but I love having something each day! Love to you, Josh and Micah. Thinking of you, Josh, Micah and Evie this month. What a special way to remember and honour Evie's first birthday! Sending you love and a big hug.